Can you help me find a star? We often receive email messages asking for help finding a star. In this post we will give instructions for displaying an image of a star in SkyView, as well as provide further tips for finding the star on a star chart and determining the star’s constellation and one final note about purchasing a star. 1. To generate an image in SkyView you’ll need a set of coordinates – the star’s right ascension and declination. These are the stellar equivalent of the latitude and longitude on the Earth. These may be in various formats but the RA usually is given as three numbers – hours, minutes and seconds. The first is between 0 and 23, the second between 0 and 59 and the third between 0 and 60. The third number, the seconds, may contain a fractional part. The Declination is similar, but the the first number can range between -90 and 90 and is called degrees not hours. Coordinates in this format can be used in the SkyView Query form. Enter the coordinates in the Coordinates or Source input box. 2. Next a SkyView Survey needs to be selected. 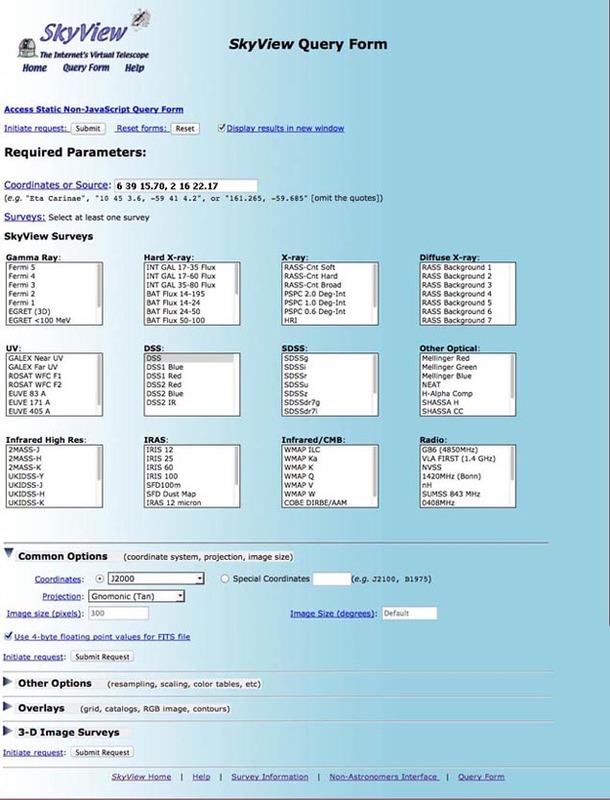 The SkyView Query form provides many surveys in many wavelengths. Typically someone trying to find a star will want to see how it appears in the night sky so an optical survey is best. 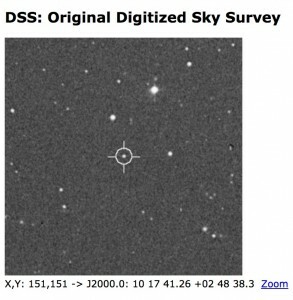 The best survey to start with is the Digital Sky Survey (DSS) which is at the top of our DSS survey category. 3. Once at least one survey is selected and coordinates are entered the user can click the Submit button and an image of the sky centered on the coordinates will be displayed. Below is a partial image of the SkyView Query Form showing the coordinates entered in the Coordinates or Source box and the DSS survey selected. Below the form is an image of the star that displays after the form is submitted. The SkyView Query Form has many other options for manipulating the SkyView image to change image size, image colors, resampling, projections, coordinate systems or to add contours and other overlays. These are just a few of SkyView‘s features. An example would be the option to mark the center of an image with a circle. Apply this feature in the Overlays section of the Query Form (see below). 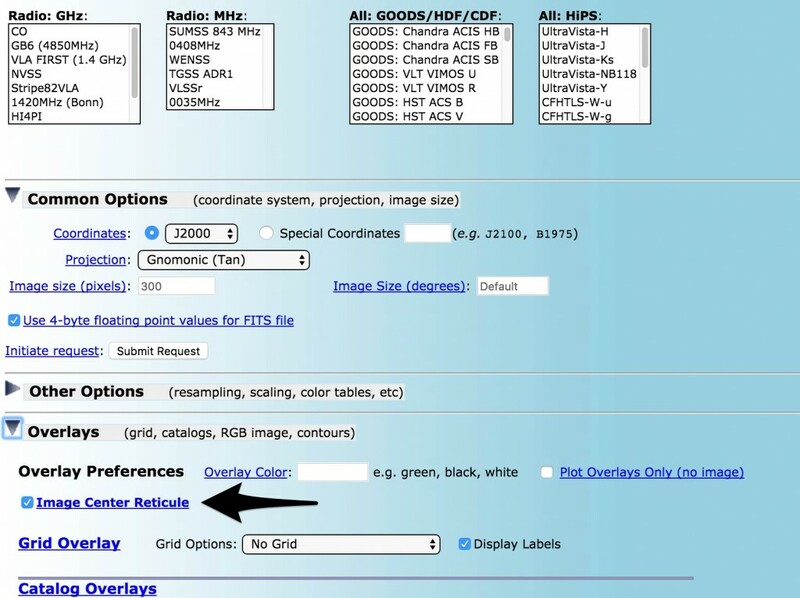 Check the Image Center Reticule option before submitting the query. http://vizier.u-strasbg.fr/vizier/VizieR/constellations.htx#q: Displays boundaries for constellations. Enter coordinates below the list of constellations. http://www.fourmilab.ch/yoursky: Get images of entire sky as viewed from a given location at a specified time and date. Their Virtual Telescope shows constellations and other objects at specified coordinates. This entry was posted in Discussion. Bookmark the permalink. 140 Responses to Can you help me find a star? My first response had an error in the coordinates. The image came up, thank you. How would I use said information to locate the star in the sky? Depending on where you are in the world you may or may not be able to see Pisces at night at this time of year. A good site that can help is Heavens Above . Click on the “Unspecified” link next to “Location” in the upper right corner and enter your location and click the Search button. Then click the Update button below the map. This should take you back to the main page. Click on the “Interactive sky chart” link under Astronomy. This will show you a sky chart for your location. Change the time at the top (to a night time) and update to see the constellations that are visible at that time. I am sure there are other websites that can help with this as well. Would you please help me. I am having a really hard time locating my late husbands star or any info on it. I am getting rather frustrated. I hope to hear back from you. Thank You. Then select the DSS or DSS2 surveys in the the “DSS: Optical” survey box. Then click the “Submit” button at the top of the form. An image will be displayed centered on your coordinates. If you have further questions let me know. I have the coordinates 8 19 33 42+ 14 44.70 I know it’s n the sky but is it over land or water. Idk much about this. Where is located above earth besides in the sky. Thank you so much. The Virtual Telescope (bottom of page) van help you determine in which constellation the coordinates are located. The other forms on this page can help you determine what part of the sky you can see from your location on earth. If the blog post or the comment responses at the bottom of the blog post don’t help you can send us your coordinates and we can try to help. in the Coordinates box on the SkyView Query page and select DSS under Optical:DSS. 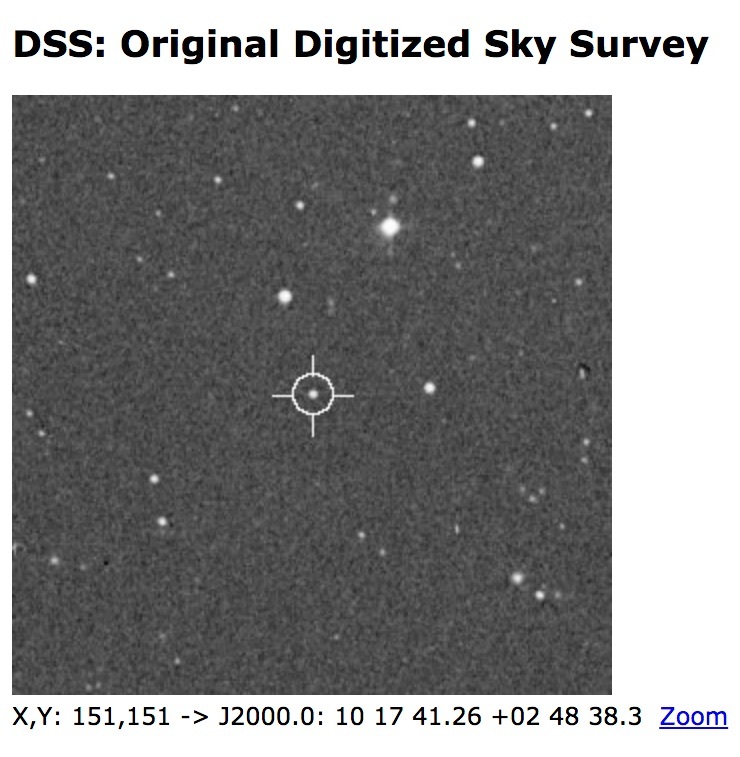 An image from the Digitized Sky Survey will be displayed centered on your coordinates. Perfect information about how to coordinate a star but it will be possible through RA and declination should be conditionable. Hi can anyone help me with this? Then select the DSS or DSS2 surveys in the the “DSS: Optical” survey box. Then click the “Submit” button at the top of the form. An image originating from a telescope survey of the sky will be displayed centered on your coordinates. 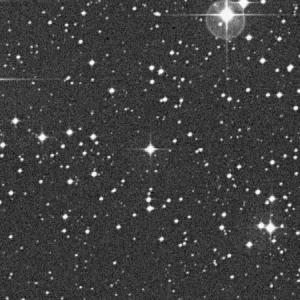 i would like help in locating a Star. 0h 22m 26.30s 22° 42′ 0.16 any help would be grateful thanks. If you have further questions please take a look at the comments section of the post or let me know. You can enter the star name HR 5764 (or the coordinates) in the Coordinates box on the SkyView Query page and select DSS under Optical:DSS. An image from the Digitized Sky Survey will be displayed centered on the star. i impressed for your blog.very use ful because i improve the knowledge. information and knowledge of your article really nice and helped us, I thank you. If you have further questions please take a look at the comments section of the blog post or let me know. in the Coordinates box on the SkyView Query page and select DSS under Optical:DSS (or any other optical survey). An image from the survey you choose will be displayed centered on your coordinates. Use the Sky Map section at https://www.fourmilab.ch/yoursky/ to see a diagram of the sky at your location. Select the city in the list closest to your location. When the map is displayed you can adjust the time to your observing time. Then select the DSS or other surveys in the “DSS: Optical” survey box. I was wondering if you could help. My star co-ordinates are written as 12:58:00.803-17:40:51.66 could you please help me to format it in a way that I will be able to see my star its very important to me. First time ive been on here. I greatly appreciate all that’s shared. Hello i named a star after my brother in law that passed recently, having trouble to find it could you please help. Really appreciated post. This information will help to others. Thanks and keep posting. Good luck. I apologize that we have not gotten back to you sooner. There are several resources for getting information about objects at or near your coordinates. You will get a list of nearby sources with the closest at the top. If you click on the name in the Name Column you will be given more information about the source. I took a look at the resulting images and do not see a star right at the center. If you see that there is a typo in the coordinates you were given let me know and I can convert them to the SkyView format. I absolutely love your blog.It is more informative and useful to the readers.Thanks for sharing this knowledgeable content, will be looking forward to your future updates.